SAVE BABY CLOTHES AND MAKE A QUILT WITH THEM FOR A KEEPSAKE. - ProudMummy.com the Web's Community for Mums. 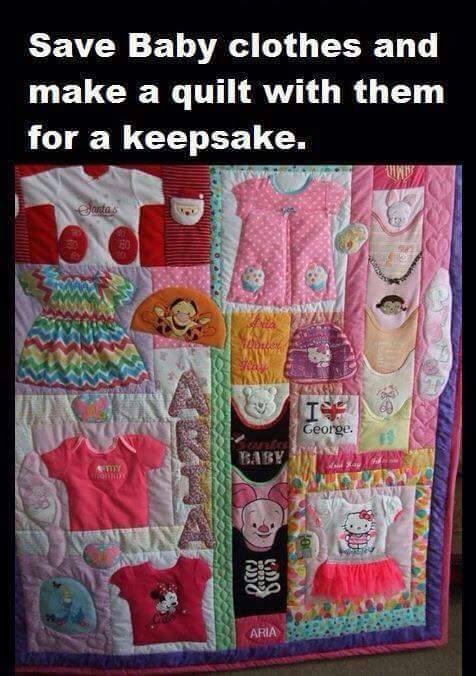 Home » Memes » OMG » SAVE BABY CLOTHES AND MAKE A QUILT WITH THEM FOR A KEEPSAKE. SAVE BABY CLOTHES AND MAKE A QUILT WITH THEM FOR A KEEPSAKE. What a good idea. Bit late for me though! Lyn Holmes. Was this your handy work! You could end up with 10 quilts Nicole! Victoria Allegrini-Collins this is so your kind of thing. Shannon Pentecost I could do this for you. Claire Dannielle what do you think? Daniellen Higino Rosane Guimarães olha que legal!